Fiduciary Duty: The SEC is deciding on a rule that would raise investment advice standards for brokers by imposing universal fiduciary duty for anyone providing retail advice. Regulatory Observations: FINRA is concerned about the suitability of recommendations to retail investors for all products, including heightened concern around sensitivity to interest rate changes, index volatility, fee structures and complexity of products. Importance of Continuous E&O: An Insured must have E&O insurance at the time the insurance product is sold and at the time in which a claim is reported without a gap in coverage. Alternative Investments: Should you consider reinsurance for claims involving alternative investments? The SEC and FINRA are getting tough on broker-dealers, putting intense focus on those recommending and selling alternative investments. Why? They are seeing that firms and reps are lacking an understanding of the product's nature, including absence of liquidity, product "holdbacks", and other risk factors associated with investing in non-publicly traded products. 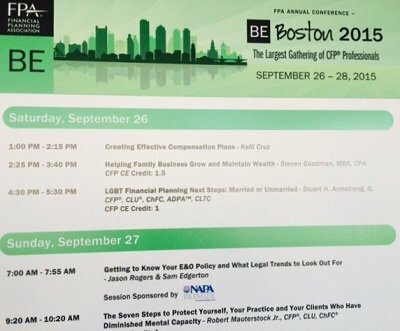 Cyber Liability Exposures: Personally Identifiable Information (PII) & Personal Health Information (PHI) are extremely valuable commodities. Make sure what your E&O plan does and doesn't cover. The April 2015 SEC Cybersecurity guidance for RIAs asks what preventative measures has your firm taken, do you have written response plans in place for data breaches, is your data encrypted, and how is access to your systems managed? NEW! 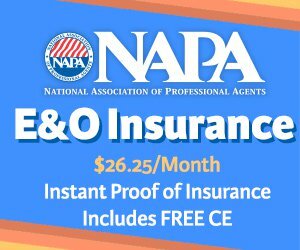 NAPA has recently launched a new E&O program endorsed by the FPA for its members and includes coverage for RIAs, Financial Planners, Registered Reps, and Life & Health agents also selling series 6 and/or 7 products. NAPA continues to stay on the forefront of this ever-changing landscape and will monitor how rules and regulations impact professional liability coverage needs in the future. NAPA also provides a platform for financial professionals to address cyber liability concerns with our suite of Cybersecurity products including comprehensive Cyber Liability Insurance, a Data Breach Compliance & Certification program through Infosafe®, and a Computer Security & Tech Support program through iCare Pro.